Alexandra Podkolzina has spent most of the last two years at the top of the girls rankings. First it was the 16s and then it was the 18s, but it was always a place she deserved. Born in Moscow, Alexandra lives in Northern California when she isn't competing in -- and winning -- tournaments. The about to turn eighteen year old won the USTA Super National Hardcourts and Claycourts last year as well as numerous Northern California events. 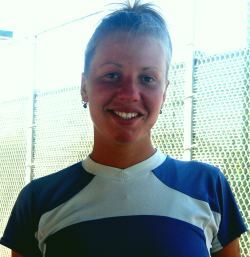 She had also won the 16s Claycourts and Hardcourts the previous year and the Spare Time Super Series in 2000 and 2001. Despite all the pressure to begin a professional career, Alexandra has chosen to not only go to college, but to go to one of the most academically competitive -- California-Berkeley. Education has always been a priority in her life and tennis trophies were not about to change that. I sat down with Alexandra at the Super National Hardcourts were she was touted to become only the third girl to win the event in back to back years. The pressure proved to be too much, however, Alexandra did make it to the finals where she lost to Theresa Logar.